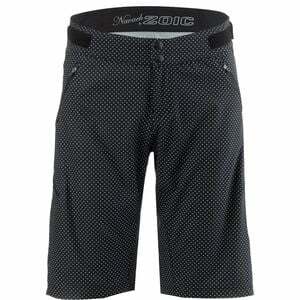 When you've got a hard-hitting day ahead of you, what better way to throw some fun in the mix than with the Zoic Women's Navaeh Novelty Shorts? Specifically designed just for women, these shorts are constructed from playfully printed stretch fabric that won't bind your movements. The fit finds a balance between regular and relaxed to provide enough room to move without an overly baggy cut. An 11-inch inseam provides length in the thighs to cover your knee pads, while the gusseted design promises mobility and eliminates seat hang-ups. The waist combines a touch of elastic with two hook-and-loop tabs to provide a comfortable fit that can be dialed in to just the right spot. A variety of zippered pockets offer plenty of room for your essentials whether you're powering up the trail or headed to the pizza parlor for your post-ride chow down.